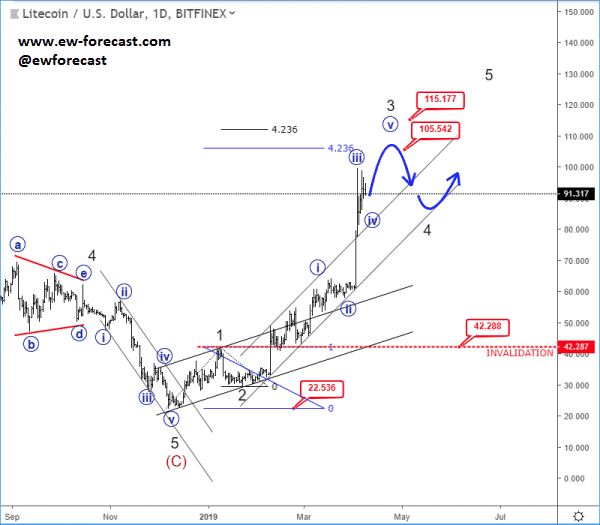 Litecoin is already rising in an impulsive fashion within five waves, which suggests that the bottom at 22.50 level can be in place. 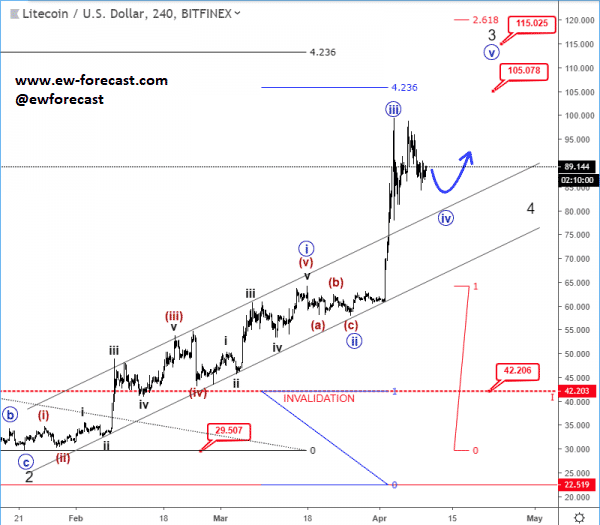 That being said, we are probably in a wave 3 and there can be room for more gains, towards 105-115 area, where price may slow down into a wave 4 correction before a new continuation higher for wave 5. For the survival of the bulls, price must stay above 40.20 invalidation level. Now swithcing to the 4h chart of litecoin, we can see that the mentioned cryptocurrencie made an extended wave towards 100 area, which we labeled it as part of a wave “iii”/3, so current consolidation can be part of a corrective wave “iv”. This wave ”iv” can send price even higher towards 105 – 115 area for wave “v”/3, where bulls may slow down again into wave 4 of a higher degree. That being said, we remain bullish as long as price keeps trading above 42.20 invalidation level.